Netflix’s new, original documentary Flint Town will premiere globally on March 2. We got an early look at Flint Town‘s eight episodes. The documentary gives a graphic look inside the Flint Police Department, the poverty that has grown through the city and the never-ending battle against violent crime. The word “documentary” often seems to have lost its meaning in modern culture. Many documentaries produced today are nothing more than partisan propaganda. The documentaries start with a preconceived notion, then seek to prove those ideas throughout the film. Those films preach to the choir of those who hold similar viewpoints, while doing nothing to advance any meaningful conversation. Flint Town is not one of those documentaries. If there is any agenda here, it is that cities filled with violent crime need a budget to support a large police staff. Flint Town follows several members of the Flint Police Department as they battle through personal and professional issues. We see the financial challenges of the police department and the personal toll it takes as they hope for a millage renewal from voters who have little faith in the system thanks to prior financial issues and the Flint water crisis. We also hear from those who distrust the police and are sick of dealing poverty and the crime it brings. Graphic language and views of bloody, dead bodies begin in the first scenes of the documentary and continue throughout. The U.S. Census Bureau named Flint the poorest city in the country in 2017. The same year also saw Flint return to being one of the FBI’s ten most dangerous cities in the country. These statistics go hand-in-hand. Flint Town shows the city’s police department handicapped to end the cycle of violence due to a lack of funding which stems from poverty. Over a ten year period Flint’s police department was cut from a staff of 300 to 98. That’s the lowest staff of any similarly sized city in the country. The documentary shows many residents who feel helpless as they wait for hours after calling 9-1-1. They don’t want to hear excuses about being understaffed. They just want help, but it’s help the police can’t find time to give. In one of the opening scenes, we see a man wait 27 hours for police to respond to a call for “robbery/assault.” In another scene a police officer is forced into 9-1-1 triage with a list of 50 calls to respond to, but only four cars on the road. As he reads through the list including many “domestic” calls, “animals attacking people,” and “trees in the road.” He laughs at “larceny” saying that they will not get through the list that day. One police officer explains that some people just need someone to talk to. He says you have to have empathy and sometimes be a bit of a social worker, but you have to do it in 15 minutes. Desperate for change, Flint votes in a new mayor which leads to a new police chief and new ideas. 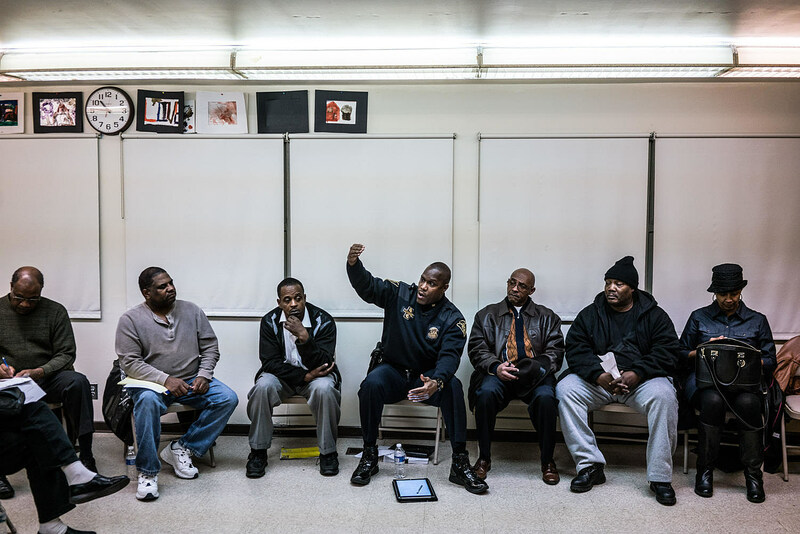 The new police chief quietly sells seized weapons to raise money and creates a new team of 10 hand-picked top police officers to aggressively fight crime in the toughest areas, the Crime Area Target Team. The ideas bring some results, but ultimately the same challenges remain. Among all of these struggles, the Flint water crisis continues. Bernie Sanders, Hillary Clinton and Donald Trump all come to town, but they look like outsiders. At a Bernie Sanders town hall a resident comments, “We have a water crisis right now, but that’s not the only problem we have here.” Meanwhile, some Flint residents have to remember to pick up their water by 4:00. We hear about the good old days in Flint. One woman who has been there for 55 years says they used to leave their doors unlocked, but now a house on her street has had at least six shootings. In another scene we see a whole city block of vacant houses where there were no vacant houses just 15 years earlier. We see into the personal life of some members of the Flint Police Department with new babies, a mother/son team of new cadets, relationship problems and deaths in the family. These struggles combined with the stress of the job are too much at times and it becomes even harder when police are starting to be targeted by shooters across the country. After a social media post suggests Flint police will be targeted, police are instructed to carry extra ammunition and trained how to use a tourniquet on themselves in case they are shot on the job. The documentary touches on important themes of race, fear and trust, but the best part about Flint Town is that it doesn’t cast blame. The documentary does not show police as heroes, it shows them as people who are doing their best with what little they have and making mistakes along the way. The documentary also doesn’t cast blame on those who distrust police, and the police don’t blame them for not trusting them either. Flint Town uses strong cinematography to show a systematic problem of poverty and crime that continues thanks in part to a city that is underserved by its police force because its police force is underfunded by its government. It leaves a lingering and appropriately bad taste in your mouth.